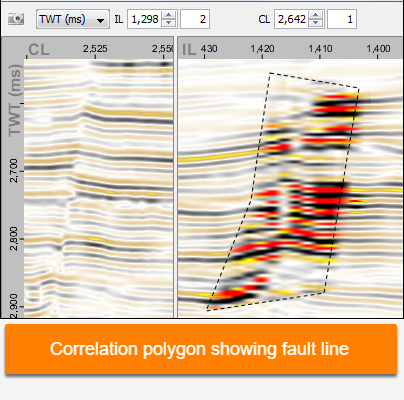 Correlation Polygon allows users to create a copy of the current data inside the polygon and place it anywhere on the view for easy comparison to other volumes or locations. Note: Correlation polygons are not available when displaying groups. In this case, switch to the individual volume in the group before displaying the correlation polygon. Create or select an existing polygon (see Creating a polygon). Right-click in the polygon and choose Create correlation polygon. Drag the correlation polygon anywhere within the view. As you navigate to other locations, the correlation polygon will show the original data, including any horizon running through the original polygon. In the 3D View, the correlation polygon will move along with the IL, CL or horizontal slice. To delete, right-click in the correlation polygon and click Delete correlation polygon. The correlation polygon is also deleted if the original polygon is removed from the session. 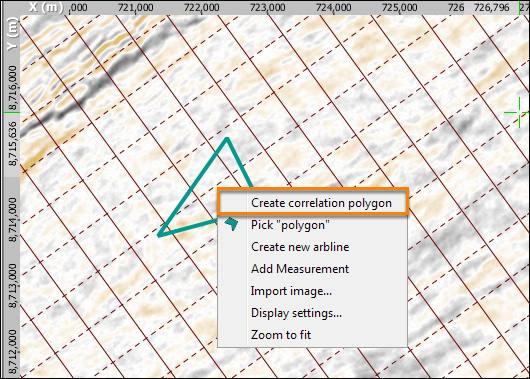 Note: Correlation polygons can be created, edited and deleted in the Map, section, 3D and Arbline Views.